Rosadyn Order & Payment FAQs. In this article we warn rosacea sufferers that significant vascular damage can be caused by the sun’s Ultraviolet Rays (UV Rays) more quickly than most think — i.e. with only 20 to 30 minutes of sun exposure. Not only can UV rays cause significant damage to the very superficial vessels of the face, but they can penetrate deep into the mid-dermis and directly damage the structural integrity of much larger feed vessels; in fact, recent studies demonstrate that UV rays reach the subcutaneous fat layer. We will also discuss other adverse effects by UV rays such as stimulating uncontrolled overgrowth of blood vessels (angiogenesis) and triggering blood vessels to grow much closer to the surface. We will discuss various lifestyle actions that may put you at risk for UV-induced vascular damage and review protective gear and lotions that may not be nearly as effective as once thought. Lastly, we will discuss the strong protective actions that oral Rosadyn, a rosacea treatment oriented nutraceutical has on sun exposure and UV damage. Sun exposure is near the top of the list of rosacea triggers and causes for rosacea progression according to the National Rosacea Society (NRS). The sun’s damaging UV rays can cause many rosacea symptoms and long-term flares but the damage to blood vessels throughout the face is one of the most important with regards to progression — often causing mild rosacea sufferers to progress quickly into the moderate-to-severe stages. Most rosacea sufferers are well educated and taught to wear sunblock everyday, especially when planning day-long outdoor activities. However, most rosacea sufferers do not realize that short term exposure to the sun’s UV rays for just 20 to 30 minutes can cause significant, irreversible damage to blood vessels in the face — in turn, exacerbating the entire disease state, the number of rosacea triggers and the duration of triggers. There are many activities that rosacea sufferers do for 20 to 30 minutes when they don’t wear sunscreen because they don’t realize the danger. 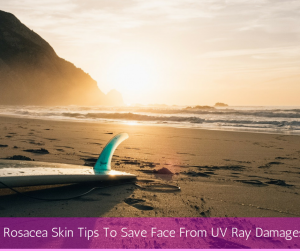 While UV rays are the strongest between 10 AM and 4 PM, Dermatologist emphasize that they can still cause significant skin and vascular damage between 8 AM and 6 PM, especially in light-skinned people and rosacea sufferers. Dermatologists have performed studies on this very subject. They have measured vascular changes, taken biopsies, analyzed skin cell changes, measured chemicals released from skin cells that adversely affect blood vessels and have performed studies with specialized dermatology equipment that mimics the UV rays of the sun so that experiments can be done under controlled conditions in a much safer atmosphere. Short term sun exposure stimulates new growth and overgrowth of facial blood vessels known as angiogenesis. This is central to rosacea progression and once grown are permanent fixtures in the facial skin. Short term exposure causes many blood vessels to grow much closer to the surface. Often times it will cause blood vessels to grow into the epidermis which is normally devoid of blood vessels. This is a serious side effect because these superficial blood vessels are now left nearly unprotected and much more prone to environmental damage. Short term sun exposure greatly increases the number of mast cells around blood vessels. Mast cells contain dozens of potent dilators – thus, more mast cells usually results in increased facial redness and flushing. Short term sun exposure stimulates damaging enzymes such as Matrix Metalloproteinases, one of the hottest subjects in rosacea research and treatment. Each sun exposure thins the protective epidermis, which in turn, results in more damage to blood vessels over time. Rosadyn contains nutraceutical ingredients that are potent UV protectors that lend significant protection to facial skin and blood vessels: Eastern White Pine Bark, Mediterranean Olive Fruit Extract and Sulforaphane. (1) Ultraviolet Rays — the sun’s ultraviolet rays (UV rays) easily penetrate the skin’s epidermis and upper dermal layers where they cause cellular death (sunburn), physically damage blood vessels, activate inflammatory enzymes and free radicals which trigger intense flushing, and cause delayed acne rosacea outbreaks (clusters of papules). It is important to note that UV rays penetrate through windows in the house and cars, so a 20 minute drive for errands can trigger all the above-mentioned side effects. (2) Exposure to External Heat — Summer heat above 80 degrees Fahrenheit can quickly increase the temperature of facial skin. This temperature increase can trigger release of damaging free radicals, activate sensory nerves that cause burning and stinging sensations, and trigger facial flushing and long-standing facial redness by activating dilator nerves located in the brain’s hypothalamus — the thermoregulatory center — that receives feedback from heat sensing nerves in the facial skin. (1) Rosadyn+ Incorporates Several Active Ingredients into the Plasma Membranes of Epidermal Cells — several active ingredients in Rosadyn+ incorporate themselves physically into the cell membrane of the skin’s outermost layers and also position themselves in the plasma fluid surrounding the cells. These nutraceuticals physically absorb significant amounts of UV rays (UVA and UVB) before they reach the first cell line in the epidermis — greatly reducing sunburn responses, cellular damage, vascular damage and facial redness. Eastern White Pine Bark Extract — Oral Pine bark extract is one of the most effective protectors against the sun’s UV rays. C0untless human clinical studies have demonstrated the protective effect of Pine bark extract against moderate to high levels of sun exposure. [ref. 3, 4] In fact, oral Pine Bark extract even enhances the recovery from a sunburn reaction if one forgets to pre-treat with this supplement. The active ingredient — Proanthocyanidins –is responsible for this protection and the higher concentration in your formula, the stronger the protective actions. Rosadyn+ incorporates the highest pharmaceutical grade concentrations at 95% Proanthocyanidin content. The combination of Mediterranean Olive Fruit Extract and Eastern White Pine Bark Extract makes Rosadyn+ a potent oral UV protector and is especially useful for people with rosacea or skin that burns easily. (2) Scavenging Dangerous UV-Induced Free Radicals and Turns Off Inflammatory Enzymes — Even if you wear sunscreen, UV radiation from the sun triggers the release of very destructive free radicals in the skin that often cause long-term inflammation and can even cause a simple case of mild rosacea to evolve into moderate-to-severe rosacea after exposure to strong sun for just one long afternoon. 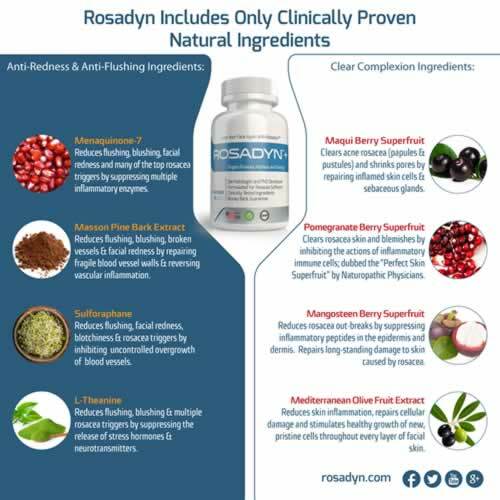 Because of this threat, Rosadyn+ has incorporated two of the most powerful antioxidant nutraceuticals into its formula including Maqui Berry Superfruit, which is, by far, the most potent free radical scavenger ever tested. These two Superfruits also turn of key inflammatory enzymes and have potent general anti-inflammatory actions against multiple forms of sun-induced inflammation. Pomegranate Superfruit Extract — Oral Pomegranate Superfruit extract is the second strongest antioxidant according to the universal ORAC measurement. So, not only do Maqui Berry extract and Pomegranate extract exert the strongest possible antioxidant actions in facial skin, but they work synergistically to recycle each other to ensure they continue to work at their peak for extended periods of time. Skin cells irradiated with UV rays release numerous types of free radicals in very high concentrations; these cells also activate the “Master Inflammatory Switch”, an enzyme called NF-Kappa-Beta. In clinical tests, Pomegranate extract was shown to neutralize almost all UV-induced free radicals and suppress the activity of NF-Kappa-Beta. [ref. 6] These actions make Pomegranate extract and Maqui berry extract the perfect nutraceuticals to stave off dangerous UV-induced free radicals and turn off destructive inflammatory enzymes in the skin. (3) Blocking UV-Induced Acne Rosacea Breakouts — UV exposure not only damages skin cells and causes various grades of sunburn and facial redness, but it often causes acne rosacea outbreaks. With UV radiation exposure though, it often causes inflammatory cells deep in the dermis to migrate slowly up to the skin’s surface to cause clusters of papule outbreaks. This process can take several hours after UV exposure or even occur later, while you are sleeping. For this reason, we incorporated one of the strongest anti-acne, anti-acne rosacea nutraceuticals into Rosadyn+ — Mediterranean Olive Fruit Extract — dubbed “the perfect skin supplement” by Naturopathic Physicians due to its ability to treat and prevent skin eruptions. Mediterranean Olive Fruit Extract — This special nutraceutical not only blocks UV rays from triggering acne rosacea clusters, but it blocks the migration of acne-causing substances in the dermis. It does this by locating the migration trail of these inflammatory substances, physically attaching to these molecules and removing them through the lymphatic drainage system. [ref. 7] These molecules never have a chance to cause acne rosacea clusters because they are deactivated, never reach the skin’s surface… and for good measure, are permanently removed from the facial skin. (1) Rosadyn+ Reduces Heat Build Up in the Skin — Keu active ingredients in Rosadyn+ incorporate themselves physically into the cell membrane of the skin’s outermost layers which fortifies the membrane and protects each cell from absorbing ambient heat. This reduces heat build up in the skin. One particular nutraceutical also positions itself in the plasma fluid surrounding the cells which keeps large amounts of water moving around each individual cell which greatly reduces heat build up. This two pronged action protects the skin from overheating and triggering heat-induced flushing. Eastern White Pine Bark Extract — Proanthocyanidins from White Pine Bark Extract are central to reducing heat build up in the skin and subsequent heat-induced flushing. These tiny peptides incorporate themselves into the outer membrane of surface skin cells, strengthening and reinforcing layers of cells. Normally thin cell plasma membranes would absorb heat — which would result in heat build up — however, reinforced membranes reflect heat and force most of the heat back out into the air to naturally dissipate. [ref. 3 and 4] Furthermore, at the clinical doses that we use excess Proanthocyanidins circulate in the extracellular fluid surrounding cells which increases the volume of fluid and the movement of fluid. Both of these actions significantly reduce heat-induced flushing because sensory nerves in the skin do not “sense” heat build up because it has been largely suppressed by Pine Bark’s actions. (2) Helping Calm Heat-Induced Flushing and Burning/Stinging Sensations — The skin contains many different sets of sensory nerves to feed information back to the brain and elicit the proper reaction. With regards to UV rays, the skin contains sensory nerves that measure heat, burning sensations and stinging sensations. These stimuli are all sent to an area of the brain called the hypothalamus which is a major regulatory center for these sensory nerves. The hypothalamus analyzes these signals and sends back information to each nerve group. Rosadyn+ incorporated two key nutraceuticals that help to modulate these sensory nerves and hypothalamic actions that might not be in the best interest of rosacea skin. PharmaGABA — This nutraceutical increases concentrations of the neurotransmitter — GABA — in the hypothalamus. GABA has a “calming” effect on the hypothalamus and tempers its response to various triggers. [ref. 8] For example, an ordinary response by the hypothalamus to increased skin heat recorded by sensory nerves would be to send signals for these nerves to release potent dilators to cause facial flushing… which dissipates heat and normalizes skin temperature. PharmaGABA suppresses this response just enough so that the vascular dilation does not provoke a flushing response, but is still able to slowly release skin heat through tiny superficial capillaries. This is a major benefit to all rosacea sufferers and makes summer heat bearable for many to enjoy outdoor activities. Furthermore, when “burning” sensory nerves and “stinging” sensory nerves are activated by high outdoor temperatures, the PharmaGABA suppresses the relay of this information to the hypothalamus so that uncomfortable burning and stinging sensations are greatly suppressed in rosacea-affected skin. L-Theanine –This nutraceutical also increases GABA concentrations in the hypothalamus. It does this by a different mechanism of action than PharmaGABA — instead of directly supplying GABA to the brain through the blood stream, L-Theanine increases the internal production of GABA directly inside the hypothalamus and sensitizes GABA receptors so that GABA is much more efficient at any dose. [refs. 3, 4] Thus, by increasing hypothalamic levels of GABA, L-Theanine works in a similar fashion to reduce heat-induced flushing, burning sensations and stinging sensations. The incorporation of both PharmaGABA and L-Theanine into Rosadyn+ has tremendous synergistic actions and ensures that a major regulatory center in the brain acts in the best interest of rosacea sufferers. The new Rosadyn+ formula helps target the reduction of, two of the top triggers for rosacea flares — summer sun (ultraviolet rays) and summer heat. While there are dozens of rosacea triggers, sun and heat routinely cause the most damage to rosacea skin, induce the most intense facial flushing, trigger uncomfortable burning and stinging sensations, and cause delayed acne rosacea outbreaks hours after exposure to the sun and heat. 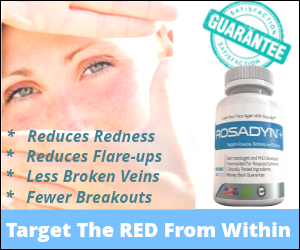 Rosadyn+ was developed, in large part, to target these two triggers and greatly reduce the intensity and duration of rosacea flares by inhibiting the penetration of the sun’s ultraviolet rays into the facial skin and minimize heat build up in the superficial skin layers. Sun Protection Inside (Rosadyn) and Out – Don’t Forget That Topical Sunblock Too! Often times these reactions stem from the fact that most sunscreens block UV rays with chemical agents. While those that use physical sunblocks, such as zinc oxide, are much better for sensitive skin, they traditionally had the drawback of leaving a visible white film on the skin. However, recent technological advancements have allowed skincare companies to micronize zinc oxide with dimethicone, resulting in a more cosmetically elegant product. Do you wear sunblock everyday? If you don’t do you find yourself exposing your facial skin and blood vessels to short term sun exposure? Many Rosadyn+ clients have mentioned reduced sunburn responses after 4 to 6 weeks of use – have you noticed a difference? Thank you for your important feedback and wishing you a rosacea-free future! “Nutraceutical and antioxidant effects of a delphinidin-rich maqui berry extract: a review. Watson, RR. Minera Cardioangiol., Apr;63(2 Suppl 1): 1-12, 2015. Health Disclaimer: Informational article above not intended to be a substitute for conventional medical service. If you have or think that you have a medical problem, promptly contact your health care provider. Before adding in or considering alternative supplements and treatments please consult with your medical practitioner first. We do not claim to “cure” disease, illness or conditions, but to simply provide you with additional information and education nor is any product sold or discussed to be considered to replace your medical treatment, diagnosis, treatment or preventative recommendations. Can ‘Specialized’ Probiotics Reduce Rosacea Symptoms and Triggers? Join Rosadyn enews to receive the latest rosacea news, product reviews, tips and rosadyn specials from our team in your inbox. Thank You for joining our rosacea newsletter! We look forward to helping you love the skin your in. We value our Rosadyn enews subscribers and client family we promise to only send out helpful and interesting rosacea news, tips and reviews with the occasional subscriber only specials. We will not share or rent your email either.